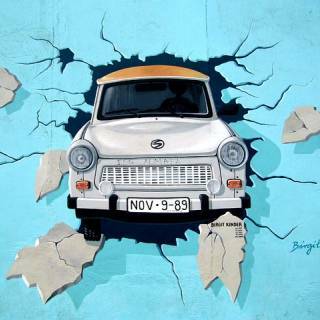 Start or interrupt your hop-on hop-off sightseeing tour of Berlin at stop East Side Gallery/Mercedes Platz. The East Side Gallery with a length of 1.316 m is the longest remaining section of the Berlin Wall. In spring 1990 118 artists from 21 countries painted 101 large format images directly on this section of the wall. Probably the most famous painting of the longest open-air gallery in the world is the "Brotherly Kiss" by Dmitri Vrubel.